I've heard/seen this site's name and occassionally lurked on TZ when T6 was out and I wanted to get decent, but sadly I really never got into fighting games strongly enough until Marvel came out. Now however, I come back to Tekken with a better appreciation and drive to succeed, with my favorite character in any fighting game and video game; Yoshimitsu. It seems if one is to become better and master a character they love, then a site dedicated to that very character and with similar if not purely stronger devotion is exactly what I need! I recall seeing Inca playing on a stream I randomly came across, and I was freaking envious, to see any use above my crappy Yoshi/Raven play. So, thank you for such a wonderful site and for your time, and I hope to make the most of the information and community here and become someone who can actually contribute instead of just absorb eventually. Well at the moment, my ps3 controllers have all but died, leaving me with a gimped AGE controller wired =/ My Marvel is either going to have to really level up, or this just means a whole other level of focus on Tekken. The site looks nice, and as much as I try to deny it at sometimes, I'm deep down a Yoshimitsu fanboy. Had such an impact on me as a kid, in terms of video games and my preference in characters afterward. Out of curiousity, what's your marvel team? People don't know on this site, but Marvel was Mango-Sentinel-hype to watch last night (ChrisG vs philipino champ)! # xXAngelBoyXx : Hey, welcome to the community. I run Deadpool/Hawkeye/Strider Hiryu mainly for lame into sugar rush antics. But my ps3 controllers are all but dead, so I have to learn how to do everything on the 360 pad....not fun. As far as Tekken goes, I have a lot of close matches online against people I'd imagine would just trounce me. Scares the living crap outta me when I see someone consistnetly doing EWGFs, but it gives me such a good feeling to at least be able to draw it down to the wire. My play is awful but god Tekken is fun enough that I want to improve. Welcome to Manjikai! I hope you can find answers to all of your questions! Thanks, though I prefer my psn Twistedsenseless a bit more. Xbox limits me so...by a single character. 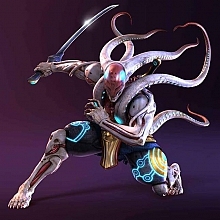 It's certainly a helpful site; even if it doesn't have all the answers, its still an amazing resource site for Yoshimitsu at large. I again, freaking love the character; I believe his Tag 2 design screams he could totally have his own Asura Wrath game, but with less anger and more....comedical, angry fortune for all. you came to the perfect site. i honed my skills here! and then last but not least, KEEP FIGHTING! Aha, one of your members already gave me help from my desperate plea on TZ. I've been doing better with the ninja and his rival, which is a tricky but amazingly fun team. I'm just glad I'm not the only one out there who loves playing Yoshi and his character in general.